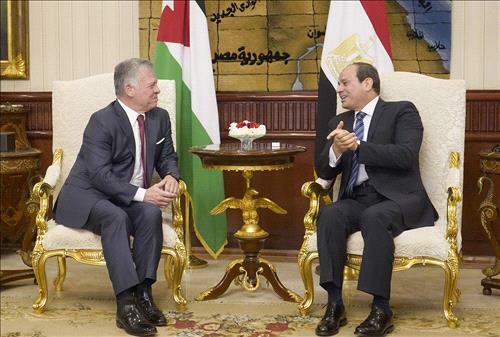 AMMONNEWS - Talks held Sunday in Cairo by His Majesty King Abdullah and Egyptian President Abdel Fattah El Sisi focused on the strong, brotherly ties between the two countries, and the latest developments in the region. At the talks held in Al Ittihadiya Palace ahead of trilateral summit between King Abdullah, President Sisi, and Iraqi Prime Minister Adil Abdul Mahdi the two leaders highlighted the advanced level of Jordanian-Egyptian ties. Discussions also covered means to bolster economic and investment cooperation, as well as maintaining coordination on various issues. His Majesty and President Sisi affirmed the importance of supporting joint Arab action and unifying positions on challenges facing the Arab world. Discussing the Palestinian cause, the King and the Egyptian president stressed the need to step up efforts to support the Palestinian people’s efforts in pursuit of their legitimate rights to establish an independent Palestinian state with East Jerusalem as its capital, based on the two-state solution and the Arab Peace Initiative. His Majesty called for ending Israeli escalations in Jerusalem and violations in Al Aqsa Mosque/Al Haram Al Sharif. Moreover, talks covered developments connected to the Syrian crisis and the importance of reaching a political solution that preserves the territorial integrity of Syria and the unity of its people. Discussions also touched on means to reach political solutions to a number of regional crises, in addition to regional and international efforts to counter terrorism within a holistic approach.